#19: 楊祖雲辯絲法 (Yang Ziyun's Method of Discerning Silk: "禹貢青州...."
Much of it is from Taiyin Daquanji, Folio 1B, in particular #19 to #28 above. About 29 to 32 see further). (87 entries; first 18 are general essays; #7 - #12 begin, "Qinlü Fawei says"
all 146 from Qin Shi (mostly identical), 12 from Qin Shi Bu (not identical), and 42 furher. (86 further biographical essays, 56 from Qin Shi [one is split in two], 4 from Qinshi Bu. Further information in the Preface. (V/...) refers to page numbers in Vol. V of the 2010 edition of Qinqu Jicheng. 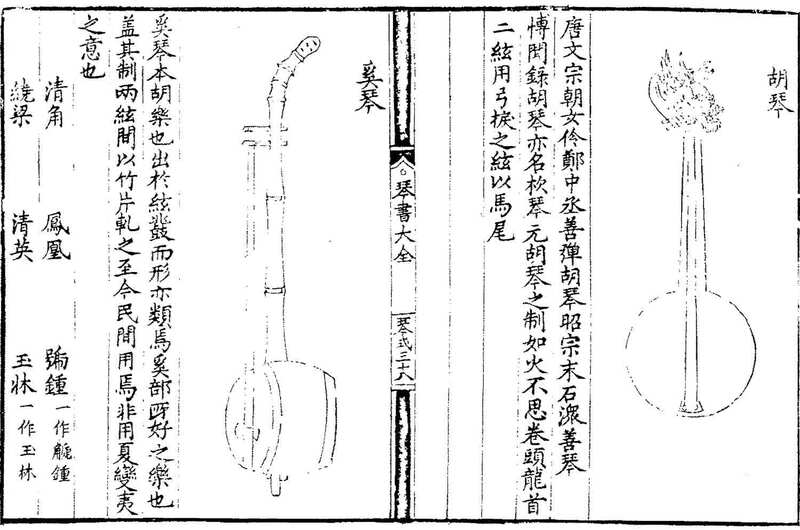 The full page as laid out in QQJC V/123 (top half) actually shows two bowed lutes: 奚琴 xiqin as well as the huqin. The text (not yet fully translated) identifies both of them as nomad music instruments. 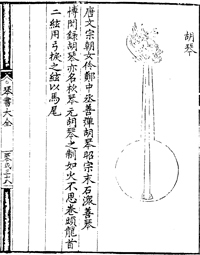 Regarding the huqin, it says a woman in the court of 唐文宗 Tang emperor Wenzong (ruled 827-841) enjoyed playing it, and that it had two strings of horsehair plus a dragon head image on top.